Classes introduce 4-8 year olds to tennis, developing a young player’s agility, balance, co-ordination, racket skills and technique. Mini Tennis Orange classes continue from Mini Tennis Red, continuing to develop a young player’s agility, balance, co-ordination, racket skills and technique. If you have any concerns regarding your or another's welfare or safety at Halton, please contact, in confidence, our Club Welfare Officer – Tom Mayer: 07771 701629 / tommayer@everyball.net or via the club office. Download our Safeguarding guidance notes here. The Halton Child Protection, Vulnerable young adults, Bullying and Whistle blowing policies, as well as Diversity and Inclusion policies are published on the Halton website and copies are available from the office. Information and policies relating to privacy, cookies, and data protection are listed here. 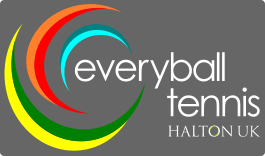 The Halton Tennis Centre data protection policy is posted here (pdf download).